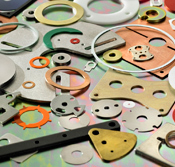 Custom Shims | Boker's, Inc.
Boker's is a metal stamping manufacturer of custom shims. Boker’s provides custom metal shims in a variety of shapes and sizes up to 12” x 12” (flat) with thicknesses from .005" to .190" and custom non-metallic (plastic) shims up to 5” x 7” with thicknesses from .005” to .125”. To expedite your order and shorten delivery time, Boker's has immediate access to 2,000 commonly specified and hard-to-find materials including low carbon, cold rolled strip and sheet steel; SAE 1050, 1075, and 1095 spring steel; blue and black temper spring steel; low alloy steel sheets; brass; copper; nickel silver; beryllium copper; phosphor bronze; stainless steel; aluminum and several non-metallic materials such as acetal, PTFE, polyester, nylon, fiber, polyethylene, and various phenolics.. Certificates of Compliance or chemical/physical analyses are available upon request. To obtain a quote for custom shims fill out Boker’s fast quote form and submit applicable production prints.